Teleread has a very insightful post up. DRM (digital rights management) has been a repeated thorn in my side. For the uninitiated, DRM is a collection of methods content owners use to restrict use of the content. Preventing a non-owner from playing a music file for example. I’ve had experience with DRM in both e-books and music. I buy tracks from Napster generally, and find the price fair. I had trouble getting the files to play on my Muvo TX MP3 player at first, but eventually figured it out. I have to transfer the tracks from inside windows media player, I can’t just drag/drop them onto the player as I do other files. But why can’t it be integrated? Drag and Drop functionality should be allowed with DRM protected files. The larger problem for me as been in the area of e-books. I am the happy owner of an REB1100 (pictured). I periodically buy content from fictionwise.com, the only large e-book seller I know of. Unfortunately, most of the new ‘best seller’ type books they carry are encoded with DRM. My REB1100 (which is not made anymore) just isn’t able to handle books with DRM in the formats available. Here again, I’ve found ways to make it work. But for a full novel, the conversion process to get rid of the DRM protection can take me 15-20 minutes of decoding the file and massaging imperfections out of the results. This is time I really shouldn’t have to use. The process is somewhat arcane, requiring use of command line tools. Is the average user going to go through that process? 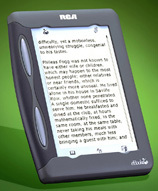 Fictionwise has now released the ebookwise-1150, a device very similar to my REB1100, built on the same technology. The 1150 is priced reasonably at just $100, including $20 worth of books. Finally, an affordable reader! (I had to scoop up my 1100 as a slightly damaged unit to make it affordable) However… publishers refuse to sell new content in the only DRM format the 1150 supports. New situation: Affordable readers that can’t handle new books. There’s no need for it to be this way. If publishers could get together and iron out competing DRM standards, eBook readers could finally take off big time. I love my 1100, and have never regretted getting it. But the average user, without my technical background, is just not going to be able to make it to work for most average-use purposes. And they shouldn’t have to deal with that. And content owners wonder why people turn to piracy. When it’s easier to do than the legitimate way, the system is broken.